Hey, SimonMoon here. I want to start a bi-weekly series where I breakdown a scenario in depth and discuss what I think a player should do and why. When I started playing I found one of the best tools I had to improve was watching high quality play and listening the explanation of why, and I’d like to help provide the same sort of tool to anyone interested in improving their play. For other tools along this line, I would also recommend watching Josh01TV stream. He does a great job of explaining his thought process for what he’s doing, and is very responsive to questions from the audience. Additionally if you come across an interesting scenario with a couple of possible lines of play, feel free to shoot me a message on Stimhack and maybe I’ll do a breakdown (or just give you my thoughts). This first scenario is a Stealth Kate vs. Foodcoats game between myself and Dogs. The game is deep in the end game, and there are a couple of useful qualities of games of this nature for analysis. First off, you can typically directly see what the ultimate result of every possible line which means you can generally get a decently objective measure of what line was the best. Additionally, in the end game there is usually a large body of information you can pull from to help you make a decision. This situation uses a fair amount of deductive logic about what the plays of your opponent meant for the contents of their hand, and how that informs your play. Hopefully seeing my approach should help you understand how to analyze situations at a high level. 8. Kate: (beth credit to 6) ??? With both players on game point, this is going to be the do or die turn. Kate has been pressured into giving up a lot of board presence due to HB being on game point, and they’ve ended in a situation where their position does not look great. However, I think there are a couple of lines that give them a non-zero chance at victory. I’ll walk through what I think the angles of attack are, and from there how good each of the lines are. Running the remote is generally the first line of attack I want to look at in a situation like this. You can usually figure out if you have a way in, and if you can your chances of winning are basically guaranteed as the advanced card is almost certainly an agenda (though it could, in theory, be a trap). Looking at this situation, we can get in the remote once (two stealth to break Ichi, six credits for Eli’s, two stealth credits to break ETR on Fairchild). This leaves you with one credit unspent at base (we can trash two things to Fairchild 3.0 because if we’re getting in and stealing an agenda we win the game). You then must contest with the newly installed upgrade. Assuming a Click One run, you end up without money to play a fair psi-game, trash Ash, or fight the Ash trace. If you gamble Click One then run, you can still get in and be able to play a psi-game, but you would not be able to beat the Ash trace (or trash Ash and run again). To decide how likely each of these situations are, we should examine both the information we know about the deck, and the play of our opponent. First off we should examine the spent influence of our opponent to see if the remote could be a Caprice. We see 2 Eli, 2 Architect, 1 Caprice, 2 GFI, 3 Jackson for 13 total influence (2 + 2 + 4 + 2 + 3), meaning there cannot be a second Caprice. Now all we should be doing is considering the possibility they are bluffing, and how likely that is relative to the remote being an Ash. Most HB Foodcoats lists run 3x Ash, 1x Caprice, 1x CVS as upgrades. This is bad, as all the cards that are not Ash are accounted for. Some Foodcoats do run a second CVS or splash for Crisium Grid, and there is a possibility of either of them. However, these are less common, which means while not zero, the possibility of the remote play being a bluff seems not great (though if you know there list, you can make a better decision one way or the other). If you assume the remote install is a bluff, then the correct play is to continue to rebuild your board state to remote lock your opponent. As discussed in the Contest Remote section, we can’t get into the remote, the only point of a bluff is to trick you into a run that wastes resources. It’s important to note that an agenda accomplishes this purpose in a strictly superior fashion, as it wins the game outright, in addition to getting an agenda out of HQ where it can be stolen. So, the only situation where this would be a bluff is A) the Corp has an Advanceable trap in their deck B) the Corp the has an Advanceable trap in hand C) the Corp has no agendas in hand. Even assuming the Corp is running 1x Aggressive Secretary, it’s still fairly low odds they’d have the Aggressive Secretary (they likely would have tried to use it earlier) and no agendas. This line seems pretty bad, and is probably worse than the Contest Remote line since Crisium Grid is more common than traps out of EtF. To understand the odds of an Agenda being in HQ, we need to examine how many Corporation draws there have been where they could have drawn an agenda and not tried to score it. Looking back at the Corp’s turn 3, since Kate has 0 credits, if they have any agenda they can safely score it without Kate contesting because Kate needs to start the turn with 3 credits for them to be able to steal. So if they had an agenda they would jam. On turn 5, they may choose to NA a 3/2 (or score it outright if they have an Ash). So we know on turn 5 they don’t have both an Ash and a 3/2 after the first draw, and likely don’t have a 3/2 at all. 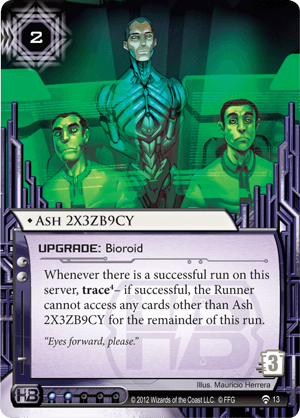 Since we are assuming the remote upgrade is an Ash, we know they either had an Ash in hand at this point, or drew it mandatory on Turn 7. In the case where they draw Ash on turn 7 and still have an agenda in hand, it means they had multiple agendas in hand on Turn 5. Since they try for a 4/2, and also would likely try to NA a 3/2 in the remote, but this is not guaranteed. The other case they can have an agenda in hand is if they draw into a 4/2 agenda on their second click draw, and then on their Mandatory draw on Turn 7 also draw an agenda. While the odds of either of these situations are not good, there still is a chance, so we can think about running HQ. If we try to run HQ, we can unfortunately only Run HQ twice. Since there is at most one agenda in hand, this gives us 1 – (¾)^2 (43%) chances of hitting a one agenda in hand (assuming an Agenda is in hand), which is not bad. However the situation where they have an Agenda in hand seems extremely slim given the Corp’s play, so this line does not seem great. Running R&D is the final option, and gets very complicated very fast because there is no way to get into R&D without letting Architect fire. We can only break 2 sentries with Switchblade, (or 3 by clicking an Ichi), but since Architect is last we cannot avoid letting the subroutines resolve. Running R&D twice seems basically impossible given the frankly obscene power of being able to fire two architects. So we’re going to run R&D in this line, likely with a Makers Eye run and potentially with a RDI boosted Makers Eye run. The first thing to breakdown is what the Corp can do with the Architect fires. Probably the most powerful and most obvious thing this sub can do is install an agenda in the top 5 to dodge the steal off a Makers Eye. If we Makers Click One or Two, then we’ll be able to check a remote that is undefended on Clicks Three and Four. If we Makers later, they can simply install in an undefended remote. Makers Eye on the last click means we’re hoping that the Corp has two Agendas in the top Four cards, or two Agendas in the top five if we Makers + RDI. If we run earlier, we still have the win if they are in the same situation, and have the possibility of contesting the remote they install in. So let’s break down how we can contest an installed Agenda. It’s important to note if they install in Server 3, the question now if we can get into Archives (as the remote Agenda is presumably now in Archives). So overall, for any of these options the question is if we can get into a single Ice remote. Since the Corp is going to be able to trash 2x programs in the line where we run a Remote, we need to assume they will destroy a relevant breaker for the Ice they are installing behind. This means any ETR code gate will stop us, we can Run through Ichi or Sherlock, and we can pay to install paperclip and break a Barrier. Architect is as good as an ETR, since we’ll be running last click they can install over the Agenda. The bad news for us is we see all three Ichi’s and a Sherlock, as well as two Eli’s. This means it’s highly likely they have a relevant Ice to defeat us, since there is likely at most only two Ice left in their deck we can beat (1-2 Barriers, 0-1 Sherlock), and they have multiple options to choose from for the best Ice. 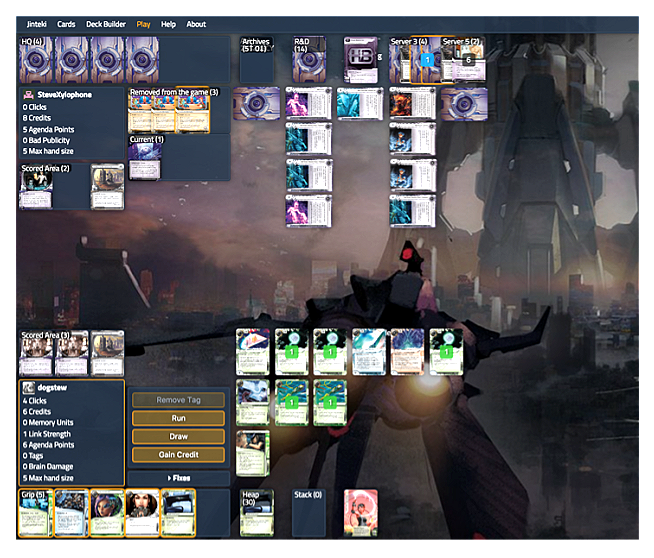 The plan of contesting the Architect installed Agenda is actually likely impossible, and just as bad as just letting them Fire Architect (off R&D) on the last Click. Since Architect is the last Ice, the most relevant thing that can be installed is likely Ash. Neither Caprice nor Ice do anything, unless the Corp is installing an Agenda with the first Sub. Ash however, is a workhorse in this situation. The install credit brings the Corp to 9, and then with the rez down to 7 the Maximum trace strength is 11. Even if we managed to force the Trace 11 (and can’t beat), we’d have to trash the Adonis campaign to keep them off of scoring credits, otherwise the Corp can gain 3 even after going broke and win on the next turn. They’d only choose to do this in a situation where installing in a protected remote doesn’t work, so we’d have to assume they’d only do so if they have two Agendas in the top four cards. However, in this situation we’re dragging the game on for one more turn, whereas in our previous line where there were two agendas in top four we were winning outright. So we can conclude that this line is strictly inferior to a line where we get enough money to Makers through an Ash trace, and a line where we can’t even force them to go below 3 on the Ash trace is even worse. This unfortunately means that we cannot install the RDI, and we need to check the money on a Gamble -> Makers play. If we Gamble, Credit, Credit, Makers, we’ll have 10 credits, which combined with our link is just enough to beat an Ash trace. This line wins if there are two agendas in the top four, which is a very real possibility ((4 choose 2)*10/(14 choose 3) = 16%). Given the poor quality of the rest of the possible lines, this is ultimately our best, and it is not a terrible line by any means. One of the key take-aways to this scenario was the degree to which various small pieces of information were important when it comes to making a decision. The contents of Archives, Influence Count, the Visible Ice, Previous Turn Plays all played important roles in what we decided to do. Understanding our opponent’s plan was fundamental to understanding what the Cards in the remote were, as well as if it was possible for there to be Agendas in HQ. The correct line of play was not immediately obvious to me or my opponent, and they tanked for a while before deciding what to do. Even though I got through a bulk of the correct decision making process in a couple minutes, there were various lines I did not see that could have been fruitful that more extensive discussion later deemed to be bad for various reasons. Hopefully moving forward this will help you use all the information available to you and what sorts of things you should be thinking about when deciding between various possible lines of play. I look forward to breaking down various situations in future, and feel free to contact me (@SimonMoon) if you have any play questions! Strategy, what is to be done.